A new cycling-to-school-project has also started in Kisozi Uganda. This programme, run by Hope Alive Uganda, will give students of Buzaya secondary school the chance to buy a bike on credit. Many students have to come from far and need to go to school on foot. Because of the large distance and other tasks at home, those students often miss out on education because they come late at school. Also, by having to go to school on foot and having to walk such a large distance, students can come across dangers on their way to school. Apart from giving students the chance to buy a bike on credit, Hope Alive Uganda has set up a training programme for youths and a small repair shop has been opened. To be able to run this project well, Hope Alive Uganda has formed teams to monitor the project. This project is meant to empower the youth in Kisozi as it is an income generating project through which the project will be able to sustain for a number of years. 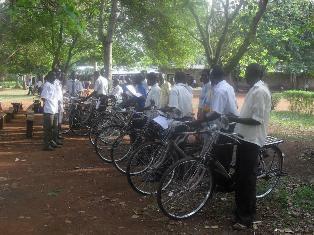 In this new project the first 50 bicycles have been given out on credit in April 2010. No Comments to "Cycle to school project Kisozi, Uganda"